I have a serious love affair with magnets. If you walked into my kitchen today you’d see at least 100 magnets on my refrigerator. I love collecting a new magnet from each place we travel and if I see a whimsical or unique magnet that gets added to the collection as well. 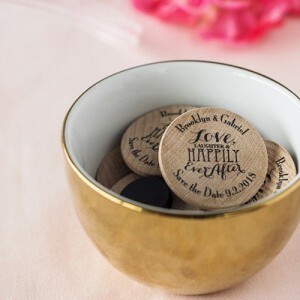 Which brings me to today’s fun wedding favor – personalized wooden magnets! These are great favors, and not just because they’re magnets. You can also choose from so many different designs – you’re bound to find something perfect for your special day! And each magnet is made from hardwood which makes it different than other “standard” magnets. Your guests will love taking home this mini favor – and each time they spy it on the fridge they’ll remember your big day! You can find these personalized magnets here.